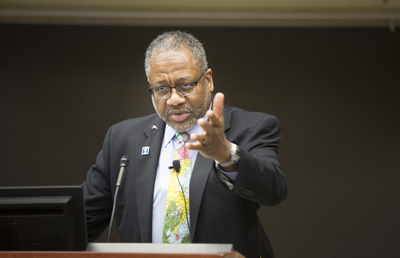 David Gordon, M.D., dean of the University of Akron College of Health Professions, gave the 2017 Martin Luther King Jr. Commemorative Lecture on Monday at Vanderbilt, touching on the theme of teamwork as it relates to health care diversity. Gordon was born in Atlanta but grew up in Ghana, Nigeria, and Sweden due to his father’s job. “Having lived in all of these areas as a kid I learned that even though we do have a lot of cultural and language differences around the world, from a human nature point of view, things are a lot more similar than they are different,” he said. Gordon received his B.A. in chemistry from Amherst College in 1973 and his M.D. from Harvard Medical School in 1979. In 1991 he joined the University of Michigan as an associate professor of Pathology. In 1997 he left academia to work for Pfizer Inc., in their cardiovascular therapeutics pre-clinical division. “Corporations, and that particular corporation, taught me about teamwork. You realize in that setting you are not going to get a drug to market without involving all kinds of professionals — toxicologists, chemists, clinical researchers, pharmacologists and FDA regulators. That’s where I learned the most practical information about teamwork,” he said. Gordon was recruited back to the University of Michigan Medical School in 2001, where he was named associate dean for Diversity and Career Development. “For anyone who embraces diversity, this is a continuing journey. I am always still learning, myself,” he said. As a self-described ‘practical idealist’ he said it’s important to pursue and embrace the triple aims of health care: providing excellent health care for all populations, improving health status and decreasing costs to make health care more accessible. His current focus is on promoting inter-professional education among the health professions, as well as on health improvement for underserved and disadvantaged populations. “One thing I try to stress with our incoming students as well as our graduates — and this is dealing with all sorts of populations and I think it’s a good guiding point — our patients, by and large, care about two things. 1) do you know your stuff? 2) do you care about them as individuals? “That outweighs everything else. Those are the things to focus on. You need to understand how you resonate with people, and this is where cultural competency comes in,” he said. During the event, William Cooper, M.D., Cornelius Vanderbilt Professor of Pediatrics and vice chair for Faculty Affairs, Department of Pediatrics, and Odessa Settles, MSN, R.N., who works in the neonatology follow-up program at Monroe Carell Jr. Children’s Hospital at Vanderbilt, were honored as the 2017 Martin Luther King Jr. Award recipients. 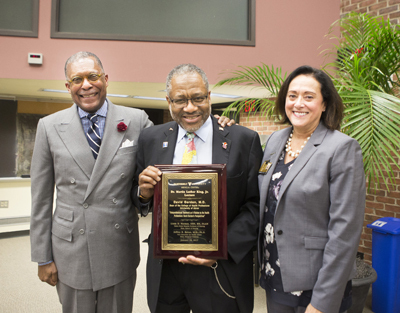 Each year the award is presented to a faculty or staff member who emulates Dr. King’s principles through his or her work. The annual event is presented by Vanderbilt University’s School of Nursing and School of Medicine.